Join us for the next chapter of our story. This year, following a highly successful re-launch, we’re welcoming you to step inside the world of Abarth. “Our ethos at Abarth is to create something from an everyday car that has this unique signature of incredible performance. Officine Abarth, at the centre of Fiat’s huge Mirafiori industrial complex in Turin, is Abarth’s very modern home. From the expansive glass-walled foyer filled with iconic cars, to the minimalist corridors adorned with design sketches and evocative images from Abarth’s past, it’s a perfect study of a contemporary workplace. Calm and welcoming, yet invigorating and dynamic, with an eye firmly on the future. Yet step inside one office and you’ll find yourself back in 1960’s. Adorning the artful slim-line desk are a vintage Bakelite phone, an old-school desk blotter and a pair of heavy tortoiseshell glasses. The walls are a visual tale of a glorious heritage for race and road cars. Dotted amongst them are portraits of the man who started this incredible journey – Abarth’s late, great, founding father, Carlo Abarth. When Abarth was re-born as a manufacturer in its own right in 2007, it was decided an office for Carlo should be retained in the new building. This commemorative act is no small gesture – after all, it’s prime office space, opposite the boardroom. 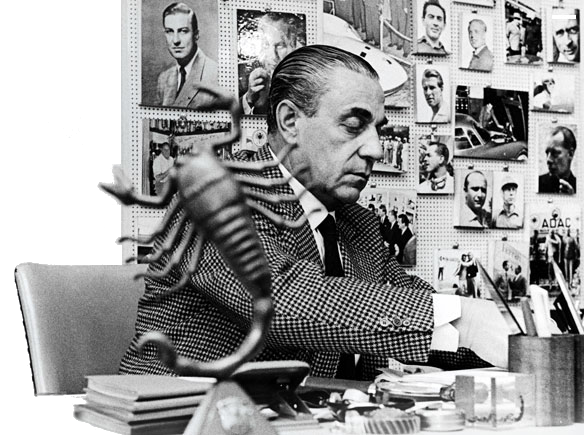 Carlo’s office, though, serves as a constant reminder of how his pioneering performance-driven ideals still sit at the core of Abarth’s ethos today. The room is full of wonderful touches and genuine items from Carlo’s original office. The nameplate on the door says Karl Abarth – Carlo’s given Austrian name, before he adopted an Italian moniker following his move there in the 1940s. On the desk are vintage pots of Cocco glue and Pelikan 4001 ink in a shade of ‘Blu Brilliante’. If you were filming Carlo’s life story, this could be a working set. And what a story you’d tell. It’s the tale of a man who built and raced motorcycles in his youth with huge success, even beating the Orient Express in a mad 1.372 km dash across Europe from Vienna to Ostend. There’s a great cast of supporting characters – Italian grand prix ace Tazio Nuvolari, iconic industrialist Ferdinand Porsche, and Cistitalia racing driver Guido Scagliarini, who all helped Carlo hone his craft, establish his reputation and start his eponymous company. Even then, the story is just getting started. On Carlo’s desk, there’s a scale model of a Fiat 600 Multipla, advertising ‘La Marmitta Abarth’ – the pioneering exhaust that established Abarth’s reputation for tuning and transforming ordinary Fiats in the early 1950s. With a series of record-breaking speed runs at Monza in the 1960s – for which Carlo resorted to a diet to lose weight – allied to racing and rallying success in the ’60s, ’70s and ’80s, Abarth’s reputation for using hand-crafted performance parts to turn small cars into giant killers was firmly established. Standing in this office you can feel Carlo’s spirit and understand why it still runs through Abarth today. “Carlo’s grand idea is more than a philosophy – it’s an absolute necessity,” says Abarth’s Head of Technical Development, Maurizo Consalvo. “Our ethos at Abarth is to create something from an everyday car that has this unique signature of incredible performance. "Everty Abarth is designed and built using technology and experience gained from the world of motorsport"
Win on Sunday, sell on Monday” goes the saying. Car manufacturers have long used motorsport as a marketing tool, highlighting the performance and success of a racing car’s speed, handling and reliability to sell its conventional road-going cousins. Carlo Abarth went by a slightly different philosophy: “Race on Sunday, office on Monday. Both with the same car.” His subtle distinction was to create road cars that had all the invigorating feel, performance and sensation of a race-ready car, but that had the characteristics and practicality of one destined for the lowly road. You could feasibly race an Abarth to the podium at the weekend, and then use it to spice up your daily commute. This ethos is demonstrated in every Abarth model – from the extreme 695 Biposto, directly inspired by the Assetto Corse that races in the Trofeo Abarth, through to the 595 Competizione and the still potent entry-level 595 Custom. “This unique ability to completely change the behaviour of a car – extracting this performance-led spirit from within – is the most important aspect of Abarth,” says Maurizio. “We always talk about the 695 Biposto as a street legal version of the Assetto Corse, but we use the same philosophy in all our cars – continuously improving performance and reducing weight, always adopting solutions that have been developed in racing. Much of Abarth’s performance comes from working with the best racing companies in the world – Brembo for brakes, Sabelt for seats and belts, Extreme Shox and Koni for suspension, the list goes on. But there’s another, less obvious, less mechanical and more human influence. “We’re making something that is an extension of a driver’s personality. There’s something about your relationship with a car – a pride of ownership that rarely extends to other possessions. It starts with the exterior paint scheme, alloy wheels and body-kits that mark your car out from the pack. It continues with the colours and materials you choose for the interior – your personal driving space. Finally, it’s how the car feels when you drive it – a ride that is taut and responsive, or smooth and refined, and an engine note that is laid-back or raucous. At Abarth, you can have your car, your way, thanks to a wealth of personalisation options. It all started in the 1950s, when Carlo Abarth sold the race-inspired ‘La Marmitta Abarth’ exhaust kit for standard production Fiats. Today, Abarth’s list of kits includes Brembo brake and Koni suspension kits for added handling performance, Esseesse alloy wheels for a dash of extra style, and the distinctive Record Monza and Record Modena exhausts to audibly mark you out. Then there are the accessories that offer a smaller, but no less distinctive touch – whether it’s aluminium pedals, oil and fuel caps, Abarth-branded interior moquette mats, or winter tyre kits complete with an Abarth-liveried snowboard. And they all come in Abarth’s distinctive wooden shipping crates, which you get to keep. “We’re not selling cars that are a commodity,” says Abarth’s Head of Technical Development, Maurizio Consalvo. “We’re making something that is an extension of a driver’s personality. It’s important that the car embodies some of your values, some of your taste. How the car will be manufactured and built also comes into consideration. Cars such as the 695 Biposto or limited-edition model runs, for example, benefit from the racing-inspired, hand-built processes used in the Officine Abarth workshop in Turin. “Using this more bespoke approach means we can be smarter about defining our product line-up – whether it’s having distinctive core cars, special editions, kits of equipment that we can add at the dealer, or hand-built cars, which is what defined the decision to build the Abarth 695 Biposto in Officine Abarth,” says Maurizio. Great performance cars are all about duality. When the open road demands it, their handling is fast, sharp and responsive. In a more contained environment, such as crowded city streets, they evolve to become more softer, more cosseting and relaxing to drive. The Abarth 595 Competizione is the epitome of this philosophy. While an extreme Abarth model – such as the 695 Biposto – offers the ultimate interpretation of a stripped-down racing car for the road, the 595 Competizione blends no-less stunning race-bred performance with refined comfort and luxurious style. It’s the best of both worlds. In the 595 Competizione, two systems adapt to the way you’re driving. Firstly, the optional ‘robotised’ sequential gearbox – a rarity on a car in this segment. It offers the race-inspired sensation of a dynamic driver-selected sequential gearshift, with all the comfort of an automatic. In the right mood and on the right road, the driver can select ‘Manual’ and squeeze the fingertip paddles behind the steering wheel for a more involved gear-change. Press the ‘Sport’ button, and you get increased throttle response and torque, giving the car a more aggressive personality. In traffic the driver can turn the gearbox to ‘Auto’, sit back and let the car’s electronic brain do the work. The second part of the 595 Competizione equation is Frequency Selective Damping, a race-inspired suspension solution which blends taut hot-hatch handling with everyday comfort, practicality and refinement. The 595 Competizione’s stylish interior also reflects its dual nature. One of the most distinctive elements is the central instrument panel with its analogue turbo dial and large, high-tech central LCD display behind the steering wheel. Press the throttle and the rev counter and throttle percentage displays dance in time to the movement of your feet on the pedals, while the g-meter shows your acceleration, braking and cornering forces. When cooking, it’s essential to start with the right ingredients. 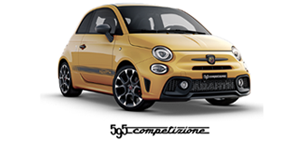 With the Fiat 500 as a base, Abarth has the perfect starting point. And, by adding the right degree of spice, they’ve turned something great into something amazing. “Our links with Fiat are incredibly strong,” says Abarth’s Head of Product Marketing and Technical Development, Maurizio Consalvo. “Not only for historic reasons, but it’s also important at the start of a project to have a good understanding of the car – what freedoms you have, whether you need to safeguard certain aspects. “Having the Fiat 500 as a base, our aim is to transform it. We obviously respect the core design, maintaining that shape, that small-car flavour. But we want to take an iconic design, and extend it in every way. Equally, Abarth’s design team are thinking about how to extend the look of the raw Fiat 500 to new extremes. As Chief Designer Ruben Weinberg admits, changing the face of an icon must be done with care. But Abarth’s close links with the Fiat design team mean it is planned from an early concept stage. Acting like a well-developed skeleton, the Fiat 500 chassis is given new muscles in the form of a powerful 1.4-litre T-jet engine, along with stiffer, more responsive suspension and brakes, a more stylish interior and new body panels. When did you last see a gearbox like this? One where the inner workings of the H-pattern are exposed for all to see, and you can hear the gears and cogs interacting beneath your feet? The Abarth 695 Biposto’s optional six-speed dog-ring gearbox is a key ingredient in its race-inspired recipe, transforming a great car into a spectacular one. The 695 Biposto is the only street-legal car with a dog-ring gearbox, making it a singular driving proposition. Developed in collaboration with Italian transmission specialists Bacci Romano, it uses all the experience gained while developing the Assetto Corse cars that race in the Trofeo Abarth. “When we first started working on the 695 Biposto, we knew if we were to be credible when saying it is derived from a race car, then we had to include elements straight from the world of motorsport,” says Abarth’s Head of Product Marketing and Technical Development, Maurizio Consalvo. “Adding a dog-ring gearbox was all about using our racing experience to offer something nobody else can offer – something that can surprise and excite our customers. “It’s important, because it brings back the emotional connection you get when using a mechanical device. Instead of simply pulling a shift paddle, where the changes are under the control of the electronic throttle and the ECU, we wanted to put the driver in total control. You have a different, more direct feeling with a dog-ring gearbox. It’s a very rapid movement and you get the sound of a mechanical interaction – tock, tock, tock – each time you change gear. The dog-ring gearbox also looks spectacular, with its exposed linkages and ergal aluminium shaft, crowned by a shiny aluminium gear knob. “It’s not something we want to hide,” says Maurizio. “We’re so proud of our mechanical elements that we want to show them off. “It’s beautiful to see this lever combined with the carbon fibre of the dashboard. It’s a link between the future and the past. A mechanical lever is an old-fashioned solution, but carbon fibre is the future. It also has a beautiful aluminium turret – a jewel – that shows we’re designing the interior of the car with the same attention to detail that we give the exterior. Collaborations with the best in motorsport. In racing, you’re only as good as your weakest link. Fortunately, at Abarth, every element of the company’s race and road cars are made of considerably sterner stuff. By working with some of the best specialist parts manufacturers in the world of motorsport, Abarth ensures that every element is honed in terms of race-bred performance and reliability. “Any racing car is a big system, made up of lots of smaller systems,” says Abarth’s Head of Product Marketing and Technical Development, Maurizio Consalvo. “Whether you win or lose depends on the smallest of detail. You need the right bodywork, the right engine, the right gearbox, but you also need the people with the right expertise to bring it all together and make it work as one. This is why the specification and option lists for all of Abarth’s models reads like a Who’s Who of Italian racing specialists – Brembo for brakes, Sabelt for seats and belts, OZ Racing for wheels, Extreme Shox and Koni for suspension, BMC for air filters and Akrapovic for exhausts. “It’s important to understand who your most experienced, your most appropriate counterpart is, to match your philosophy and your particular car,” says Maurizio. “We don’t use Akrapovic exhausts as a marketing exercise because they’re expensive or well-known. We work with them because they have the same philosophy as Abarth. Working with a portfolio of experts also allows Abarth to find the perfect solution quickly. “Abarth is not a big company, which means it’s the perfect size to work collaboratively with other experts,” Maurizio explains. “A good example was the special 695 Biposto rally car we created to run as the ‘00’ pace car on the Sardinian Rally, driven by Miki Biasion. Talk to any race team boss and they’ll tell you that very few victories occur in the moment – it’s really a matter of preparation. Teams and drivers spend countless hours before a race weekend testing cars and simulating every scenario in order to perform at their peak. The two hours of action you watch are just the tip of the iceberg. It’s the same at Abarth. That thrill from your hour-long commute or your Sunday blast in the country, is the result of Abarth’s countless miles and months spent honing its cars to perfection. Every road car – even supercars – must go through comprehensive testing and thousands of miles of running before they can be declared ready for the road, and it’s no different for Abarth. As well as honing the car’s handling and raw performance at race tracks around the world, Abarths need to be tested in the harsh -40C of a frozen Swedish forest and the sweltering 50C of a traffic jam in a desert city. After all, your Abarth isn’t just for driving around pristine circuits in perfect sunny weather. Fortunately, by using the well-proven Fiat 500 chassis as a base – and by bolstering it with components from experienced performance partners such as Brembo, Extreme Shox, Koni and Akrapovic – an Abarth can be developed far faster than a typical mass-market model. Another benefit to being part of the Fiat-Chrysler group is that Abarth can call on the latest technology and access a wealth of specialist facilities and experts. “For final approval, a car typically needs 5over 30,000 miles of real-world testing,” says Abarth’s Head of Product Marketing and Technical Development, Maurizio Consalvo. “It’s a combination of engine tests, reliability work, hot-weather testing and cold-weather winter testing. We also have subjective tests, such as handling, acceleration and braking, where we fine-tune the character of the car. This means a new Abarth can be developed in two years, rather than the typical four years for a mass-production car. Those two years matter, though. Perfection is worth waiting for, and it allows Abarth to bring in a very subjective, human touch – which ensures that Abarth’s unique character is firmly embedded in every model. “In the car industry, it’s easy to fix 90% of your variables using vehicle simulation,” says Maurizio. “The final 10% of real-world testing, though, is the most important part. This is what defines the character of the car, and what will be perceived by the people who drive the car everyday. Every great design or engineering project is the sum of its creators’ crafts, and that’s particularly true at Abarth. Each model – from the stylish Abarth 500C cabriolet, to the circuit-honed 695 Biposto and its Assetto Corse race car cousin – is the product of a close collaboration between engineering and design. You can’t have one without the other. “At Abarth, we have an amazing relationship between design and engineering,” says Chief Designer Ruben Weinberg. “As designers, we like to think about the technical details of a car just as much as the visual styling. Any car is a combination – a fusion – between the science of engineering and the art of design. It’s how you connect them that matters. That pride in engineering is something the design team shares. “We love to get involved with everything engineering do, right down to designing elements such as the engine cover,” says Ruben. “Every detail is special – it’s part of one big strategy, forming a unique identity for the car. “Equally, you don’t always need to change something. Not every engineering element has to be touched by design, and we don’t need to extend every design dimension just to make the car look more dramatic. With a performance car such as an Abarth, any visual change must be driven by function, and sometimes it’s better if something is natural – especially if it’s dictated by performance. How do you like your exhaust note – raucous, throaty, or something more refined? Well, you’re in luck, because Abarth has a range of exhausts for all tastes. Exhausts lie at the heart of the Abarth story. In the company’s early days in the 1950s, founder Carlo Abarth needed to turn a quick profit to fund his racing team. The answer: selling race-inspired Abarth exhaust kits for standard production Fiats. As well as transforming the look of the car, and – with subtle engine tweaks – their performance, it gave the normally unassuming Italian super-minis a feisty Rottweiler bark that belied their compact size. “Our obsession at Abarth is about creating cars that are unconventional,” says Head of Product Marketing and Technical Development Maurizio Consalvo. “It’s not just performance in terms of numbers – the highest power, the lowest weight, the fastest to 100km/h. What’s just as important, and harder to create, is an emotion. 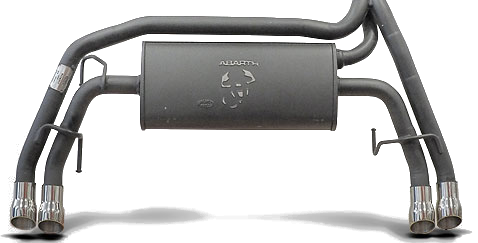 At the core of Abarth’s modern exhaust range is the Record Monza – a name that harks back to Carlo Abarth’s industry benchmark-setting speed runs at the famed Italian track in the 1950s and 1960s. By splitting two sets of twin exhaust pipes – outer and inner – engineers can run the inner pipes through a standard muffler for a more muted exhaust note for everyday driving. When the engine is run to 4,000 revs, the exhaust gas activates a pressure-sensitive valve, which opens the outer set of un-muffled pipes to deliver the full, unfettered exhaust note. It transforms a refined engine note into a raucous roar. Also available is the optional Record Modena exhaust, which uses the same technology but blends the four exhaust pipes into two, creating a different exterior look and a slightly smoother exhaust note. The king of the Abarth exhaust crop, though, is the Akrapovic unit on the 695 Biposto, with its striking titanium tailpipes. While the Record Monza uses a passive valve, where the exhaust note is matched to the revs, the Akrapovic unit uses an active valve.